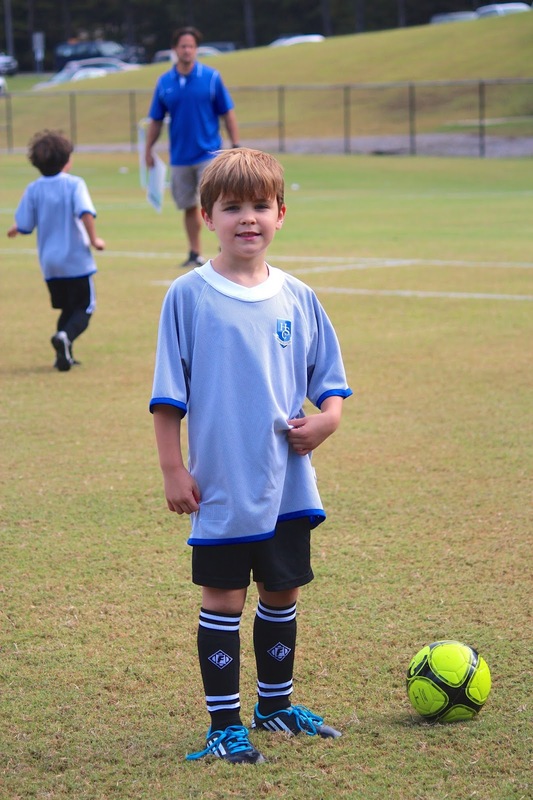 Jake is playing soccer again this season, and since Nick is also playing, we find ourselves at the field a lot. Jake got a lot of game time, because his team had a couple of kids who couldn't make the game. That meant that instead of rotating in and out a few times during each half, all of the boys stayed on the field the majority of the game. Jakey isn't very aggressive on the field, but he REALLY loves to play. He listens to his coach and tries hard to keep his mind on the game. Although he has been known to run briefly off the field during play to give me a brief hug. I WILL NEVER STOP HIM. I'm so proud of him for the way he's playing this season, trying to get his foot on the ball. Last season he kind of just ran around and hoped IT CAME IN HIS GENERAL DIRECTION. This season he's more proactive. This is probably the point at which I need to warn you, Internet. You're about to not like what you're going to see. I know this is hard to take. This blatant assault on Jakey. I mean, just LOOK at how distraught Jake's teammate Ben is over this turn of events. He played until he was tuckered out. When he finally got a chance to sit on the sidelines, he took it all in -- still intently listening to his coach's instructions to his teammates. HOW intently? Yeah, he was definitely listening. I would've given far more than a penny for his thoughts as he sat over there by himself. In this moment, maybe a hundred bucks. Soon enough, he was called back in, and he ran back out onto the field. They don't keep official score at this age, but of course the boys are always keeping score in their heads. Our "Raptors" fought to the finish. SOMEONE left the field very happy that day.